How Pedestrians Could Be at Fault for an Accident in Florida | DeLoach, Hofstra & Cavonis, P.A. Injuries to pedestrians are far more likely to be life-threatening than injuries to people protected by the safety features of a car. 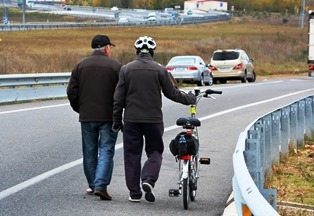 As a result, Florida laws require drivers to take extra care to avoid collisions with pedestrians and bicyclists. In the event of a crash, these laws also hold motorists accountable for the injuries they may cause. making it harder for them to get payment for their injuries. Determining who is at fault for a pedestrian accident can be complex, because there are many different factors that can affect a driver’s and a pedestrian’s duty of care. All road users have a duty to stay alert, act responsibly, and obey all traffic laws, regardless of their mode of transport. Crosswalks. Pedestrians always have the right of way in crosswalks as long as the traffic light is red and walk signal is lit. Drivers are required to stop before entering the crosswalk and remain stopped until the pedestrian has finished crossing the roadway. In the absence of a crosswalk at an intersection, drivers must stop before reaching the intersection. If the traffic signal is green, pedestrians and bicyclists are required to yield the right of way to vehicles until the walk signal is lit. Sidewalks. If sidewalks are provided along a stretch of road, pedestrians may be found liable for an accident if they were walking in the road instead of on the sidewalk. If sidewalks aren't provided, pedestrians should walk only on the shoulder of the road in the direction that is facing traffic. Traveling next to cars. When riding in the road, bicyclists are required to travel in the same direction as motor vehicles and follow the same traffic laws that drivers do. A bicyclist who runs a red light or fails to signal a turn could be partially at fault for a crash. Jaywalking. Pedestrians should only use crosswalks or dedicated intersections to move from one side of the road to the other. They should wait for traffic in all directions to pass, and never assume that approaching vehicles will yield to them. Pedestrians should also make every attempt to cross the roadway using the shortest route to the opposite curb. Disabilities or impairments. People with disabilities may not be able to cross the road as quickly or be able to see all potential dangers in their path. Drivers should take care when approaching intersections and immediately yield the right of way to pedestrians with guide dogs, canes, wheelchairs, walkers, or other sign of impairment. Bridges and barriers. All pedestrians should only cross bridges if there's a dedicated sidewalk over the bridge. Bicyclists may cross bridges on the motorway, as long as they're riding with the flow of traffic. No pedestrians or cyclists should enter a bridge or railroad crossing if a gate or barrier has been lowered or signal lights are flashing. Pedestrians who go around or under a crossing gate or barrier can be issued a traffic citation and may be considered guilty of negligence. There are many different things that must be considered before fault can be accurately determined in an accident case. Victims need to carefully assess the circumstances leading up the accident, the actions of both the driver and the pedestrian, and the accounts from witnesses and police at the scene. If you or someone you love has been involved in a car-pedestrian accident, it's vital that you speak with an experienced injury attorney. Our aggressive legal team works quickly to gather evidence, explain your legal options, and take over your case while you heal from your injuries. Simply fill out the form on this page today to make an appointment in our offices.